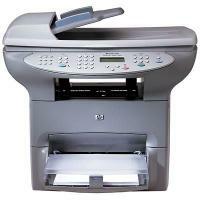 The HP LaserJet 3380 is a good match for small business groups that doesn't require colour printing. This full features multifunction printer provides ADF, scan, copy and fax functions. HP LaserJet 3380 printer is also compatible with low-priced HP C7115A and HP C7115X toner cartridges, offering the same output quality. The two-tone gray colour device weighs 16kg measuring 48 x 51 x 48 cm respectively. The device has a main paper tray at the bottom, a control panel in the middle and an automatic document feeder present at the top of the scanner lid. The maximum printing and copying resolution of HP LaserJet 3380 is 19 ppm with the print speed up to 1,200 x 1,200 dpi. The paper storage capacity of input tray is standard 250 sheets of paper and output tray can store up to 125 sheets of paper. The device supports various printing media such as card stock, labels, envelopes, matte paper, glossy paper, and transparencies. The standard 32MB of RAM is upgradable up to 96MB. The HP LaserJet 3380 makes high-quality scans and offers a lot of features, though it is slow at scanning, copying and printing graphics. This multifunction laser printer is good for small office or home users. How to solve image quality problems in an HP LaserJet 3380 printer? If you have recently bought an HP LaserJet 3380 printer and experiencing some image-quality problems. Then, don’t worry, this is a common issue that can be solved by following simple steps. Usually, these issues occur due to faulty HP LaserJet 3380 toner cartridges. Once the process is completed, make a test print on the paper you inserted earlier. If the printouts still are not satisfactory, then we would recommend you to contact HP support. Q. I have to print official documents in bulk for my business. Do compatible HP LaserJet 3380 toner cartridges guarantee quality along with savings? A. Yes, these compatibles will help you save a considerable amount of money as they are priced less, have a higher page yield than original cartridges and do not compromise on quality. You can look forward to get high-quality text documents as well as images by opting for these toner cartridges. Q. Are HP LaserJet 3380 toner cartridges available in colours other than black? A. No, these toner cartridges print only in black. Q. I purchased compatible HP LaserJet 3380 toner cartridges from you a few days back but I won’t be needing them now. My organisation has posted me overseas for some months of work so can I return the cartridges and get a refund? A. Please check the date of receipt of the toner cartridges; if it has not exceeded 30 days, you can return them to us. Please note that the cartridges should be intact in a re-saleable condition. You have the choice either to exchange the product or opt for a refund. Further, please be aware that the return will come with a 10% restocking charge. Q. We have a major upcoming event in office for which we will have to print a lot of documents. Can I use compatible HP LaserJet 3380 toner cartridges to print extensively and be sure of getting top quality results for the crucial event? A. These high capacity toner cartridges are ideal for printing documents and images in bulk with consistently good results. With these cartridges, you can print in bulk in one go and count on your printer to deliver without any glitches. Since they print up to 3,500 pages, you can continue with printing without having to change cartridges every now and then. Q. Can HP LaserJet 3380 toner cartridges withstand frequent printing? I’ve been considering purchasing these toner cartridges as someone told me they’ll be good enough for my regular printing work in bulk. Please advise. A. Yes, these toner cartridges are perfectly suitable for printing in bulk on a regular basis. They are used only after they clear stringent quality tests. Also, they are made from superior quality recycled parts, which cut down your printing costs, which will make using these cartridges a winsome deal for you. Q. Can I have an estimate of the cost of printing per page if I use HP LaserJet 3380 toner cartridges in my printer (HP LaserJet 3380)? A. The cost of printing one page with your printer and HP LaserJet 3380 toner cartridges is 0.7p per page. Q. I am noticing some unwanted repetitive vertical marks occurring on every printout I’ve been taking of late. Is there any problem with the toner cartridges (HP LaserJet 3380 toner cartridges) which I replaced recently? A. It’s likely that your toner cartridge is damaged. Try installing other cartridges and see if the marks disappear. If they do, then you’ll need to use another toner cartridge. Q. I installed HP LaserJet 3380 toner cartridges in my printer in office but I couldn’t get printouts after that. A colleague who’s familiar with computer hardware checked and said the photosensitive drum inside the print cartridges has developed scratches. What should I do now? A. You’ll have to replace the print cartridges to solve the issue, so please arrange for that. Q. Does shaking the print cartridge distribute the toner inside the toner cartridge evenly? The toner seems to be low in my cartridges as some vertical lines in white appear on my printouts. A. Yes, you need to shake your toner cartridge gently from side to side to get the toner inside to spread evenly and print like before. Q. I have been using the HP LaserJet 3380 printer for quite some time now. But for some reason, the last few print jobs have had a grey colouration in the background of the document. The overall print is pretty dark. Is it by any chance related to the HP LaserJet 3380 toner cartridge installed in the printer or is there something wrong with the settings? Please help. A. For the above problem, the HP LaserJet 3380 toner cartridges may or may not be related. You need to check if the papers in the paper tray have not been run through the device. If so, then change the lot. Use a different type of paper and try printing the document again. If the problem persists then check the humidity range and temperature of the surrounding area of the printer. The machine is designed to work in specific conditions if these conditions are not given then such printing problems are bound to occur. If the conditions are met and still the printing quality has not improved then it points to some problem in the toner cartridge. Replace the present HP LaserJet 3380 toner cartridge with a new one. Q. Why does the paper curl up once it is printed on? A. There are two types of paper curls, positive curl, and negative curl. Positive curl occurs when the printed area is high coverage and the surrounding environment is dry. In this case, the paper will curl towards the side which is printed. To correct it, print on a heavier paper than the one you are using. Negative curling occurs when printing coverage area is low and the surrounding is humid. The paper will curl away from the side that is printed. Use a lighter paper type and store it in a dry environment. You should also use the duplex printing mode. Q. My HP LaserJet 3380 printer has suddenly disconnected from the system. The USB is connected to the PC but there is no connection visible. I am not able to print it. It was working perfectly a while ago. How do I make the connection again? A. If you use Windows XP, this problem of connection may appear. When the printer is not in use, Windows XP disables the USB port in order to save power. You have to disable the power management that is there on the USB root hub. To do so, you have to lick on the Start button followed by My Computer. Now go to Properties and select the Hardware option. Select the Device Manager option. Double click on the USB Root Hub option and now click on properties. Here select the Power Management button. Uncheck the box next to the “Allow the computer to turn off this device to save power.” Click on OK. This will save the change. Q. When I take a printout, the toner is flaking and rubbing off from the paper. Is the HP LaserJet 3380 toner cartridge of a poor quality? What is causing this problem? A. A bad quality HP LaserJet 3380 toner cartridge might not be the only cause of this problem. To begin with, clean the print path of the printer. Now check if the paper type that you have loaded in the printer is same as that in the print settings on your system. There might be a possibility of insufficient power supply. Plugs it into an AC outlet and print again. You might have to replace the heating element if the heating element check does not come clear. Replace the fuser and the HP LaserJet 3380 toner cartridges.